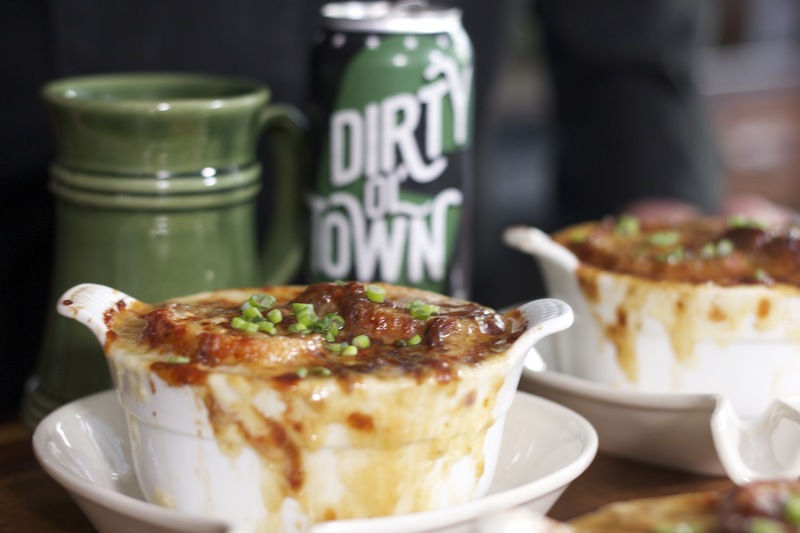 Your typical French Onion Soup with a twist, added shrimp and scallops and made in an IPA beer broth. Fantastic! Comfort food, yummy, succulent, cheesy, flavorful, and perfect for a cold day! When one mentions French Onion Soup, stomachs rumble and mouths salivate. Very few people not like French Onion Soup. But French Onion soup is originally made with beef or chicken stock. 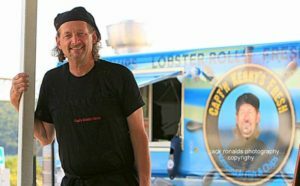 You could also make it with vegetable stock, but Kenny came up with an even richer way to make it, with seafood and beer! Gobstoppers! Talk about being at the sea! Although I suspect a French Onion Soup would be a stretch to cook back on the days of the pirates, these days, anything is possible and Capt’n Kenny’s French Mermaid Onion Soup is the perfect example of the sea marrying comfort food. It was no easy feat, though. Modifying such a famous recipe could be very challenging. Our first challenge was to figure out if the seafood was going to be overcooked by the time the soup was ready. There is nothing worse than a rubbery shrimp or scallop! But also, you want to make sure you don’t eat it raw. So Ken tested it pre-cooking the seafood only 80%. This guarantees it will be completely cooked but not overcooked. In fact, we were very pleased when we tried it, as the shrimp and scallops were very tender and excitingly filled with flavor. They were easy to taste and the beer worked as a flavor enhancer. Adding beer though was a bit scary. 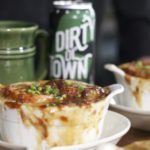 The beer we used, Dirty Ol’ Town from Garrison Brewing is a delicious artisan beer made in Halifax by the same company that makes the beer for our batter. This particular beer is a black IPA beer with a hoppy taste and remembrances of chocolate malt. It was a risky move, as the beer gets very bitter when cooked and then this beer was naturally bitter, so Capt’n Kenny balanced all that bitterness with a touch of lemon and brown sugar resulting in a seducing aroma and taste that makes this soup unique. The resulting French Mermaid soup was very rich and enough for a meal to be devoured a spoon at a time in order to slowly savor all the flavor notes of this enhanced traditional dish. Batten Down the Hatches and get to the Galley! Start Cookin’! As always, we love to hear from you. Leave us a note and let us know how yours turned out! If you haven’t done so, subscribe to our mailing list and our YouTube channel. We have some really cool surprises coming this year and you don’t want to miss them. Your typical French Onion Soup with a twist, added shrimp and scallops and made in an IPA beer broth. -	In a large stainless sauté pan melt butter over med-high heat, add shallots and onions and cook for about 20 minutes. -	Keep cooking and deglaze with dry sherry until onions are golden brown for about 1 ½ hours in total. Season with salt and freshly cracked pepper. -	While the onions are cooking, in a separate pot, add the beer and seafood broth, thyme and bay leaf and simmer for 5 minutes. -	Add the sugar and the lemon juice and rectify bitterness. If the broth still too bitter, add more lemon and sugar but not too much as the onions are sweet too. -	When the onions are ready, discard the thyme stems, the bay leaf and add to the broth, mix and set aside. -	Pre-cook the scallop and shrimp in a skillet with butter and olive oil only until pink on the outside but not completely cooked. Approximately 80% cooked. Set aside. -	Assemble the soup by ladling a small amount of broth to cover the bottom of the dish, place two toasts, place four shrimp and four scallops, cover them with broth and then the cheese mixture. Add two more toasts, cover with broth and top with cheese. -	Place the bowls in cooking sheet. Broil until cheese is melted and slightly browned. Garnish with chives and serve.